The WRARC held it’s regular meeting at the American Legion building in Danville Ky on May 22, 2018. Those attending the meeting were: KG4UQL, KF4FMQ, KG4VCR, WQ4Z, KE4INO, WD4LEW, K4FT, W8MW, KB4NPW, AC4NE, KJ4ND, KY4KD, KA4SWT and KI6SEP. President Mike May called the meeting to order at 7:32pm. Mike asked if there was a motion to dispense with the reading of last months meeting. John W made the motion to dispense with the reading. Peter 2nd the motion and all members agreed. Mike asked ken for a treasury report. – John W 2nd the motion and all members accepted. D-Star Ken said that the American Legion Dstar net is growing and they had 19 check-ins from 4 states. The next net will be held on June 5th at 8pm on REF 056C. By-Laws Mike said he had brought in copies of the new by-laws and Chris has a copy. Sharon asked if a copy will be placed on the club’s web site. Ken said yes it will be no problem to do that. VE TEST SESSION John W said that 5 people came to the last test session with 2 getting their tech and 3 getting General. The next testing date is July 25th here at Legion. Ken wanted to talk first before getting to field day. Ken said he had made a big mistake for the field day weekend. He had waited to get it on the legion calendar and with that the legion has planned a event too. When he discovered this he called the officers and board members to let them know of the boo boo. To all of those the response was no worries we will make it work. The legion has planned a Fathers Day meal and a band, this will run from 5pm to around 8:30pm. The legion is paying for the meal so our Saturday night meal is taken care of. Sunday we are on our own. Chris said this can be a good thing since we have no idea on who might attend to get us some public exposure. This we can make into have fun and enjoy. I’m not going to try to get into all the things talked about since i could not write all down fast enough. The jest of the plans were broad. John W had a drawing on a lay out for antennas and radios this can change since we don’t know the weather. The legion plans on the band being outside but if it rains things change. So the short version of the thing brought up was if you plan on attending bring coax, extension cords and portable poles. We think we have enough wire antennas but the other items it better to have more than not enough. If you can think of something and want to bring do so you never know. Field day is JUNE 23-24 this year. We will start setting up at 8am and getting on air around 2pm. Tear down is Sunday 2pm so iff you can we need as many people to help since it seems not all come back to help with this, it does take awhile to tear this down. The list below mentions some of the things being brought or taken care of. Mike May—– Back up Generator. Andy— Solar Panel and Battery. Sharon—- Media Table, Saturday lunch (pizza,chips,drinks and plates). Chris— Newspaper and invites to elected officials in county government along with other agencies. All members if you have a facebook page advertise field day. Check out desktop computers on the 9th or around this date. Motion was made to order Dacron 3/16 rope 1000ft all approved. So as you can see we were busy and i’m sure i missed something. It just breaks down to if you have it bring it cause it might be needed. 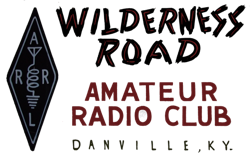 Ken mentioned that the Ky QSO party is Saturday June 2nd at the club room and will run 10am to 10pm. Ken, Mike and Chris said they will be there so all are welcome to come. Chris said that if you have been on the weekly nets then you have heard Gi check in from Anderson county. He said she has contacted him and will be coming since no one around her is doing this event. Ken said that the club has been asked to help in this special event Saturday the 26th from 1-4pm on Dstar. The is a legion event. John W made the motion to close the business portion of the meeting. Sharon 2nd and this portion closed at 8:47. Presentation Mike brought in a simplex repeater controller that Radio Shack made Model 19-345. He brought in a couple of ht’s to show how it worked. Simple to setup and good for emergency. John W brought in his Ubitx kit and wanted others to see the box he ordered for it. The box was $34 and shipping was $20 the cheap shipping. The box came with extra parts that can connect to the kit and still has some tweeking to do to get it completed.